An early examination for women, administered at Harvard University. The Harvard University Examinations for Women were not part of an application, as women were not admitted to Harvard at the time--a successful exam was a mark of academic merit and women could take them independent of their plans for a college education. This particular example is from 1890. Radcliffe College. Admissions Office. Records of the Admissions Office, 1869-1979; Harvard University Examinations. Papers Used at the Examinations for Women, . RG XI, Series 2, box 2, folder 11. Radcliffe College Archives, Schlesinger Library, Radcliffe Institute, Harvard University, Cambridge, Mass. 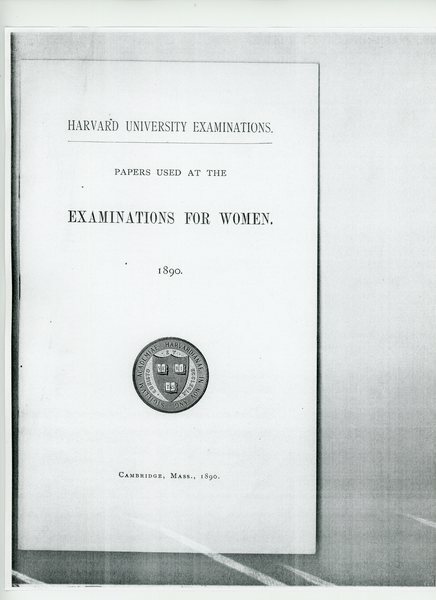 Harvard University, “Harvard Examination for Women,” The Albert M. Greenfield Digital Center for the History of Women's Education, accessed April 18, 2019, http://greenfield.brynmawr.edu/items/show/1446.